Here's an example on how to send PESOS Token to any recipients in bitshares decentralized network. In your bitshares Dashboard, click the "Send" button to initiate the transfer. You need to know your recipient bitshares account. 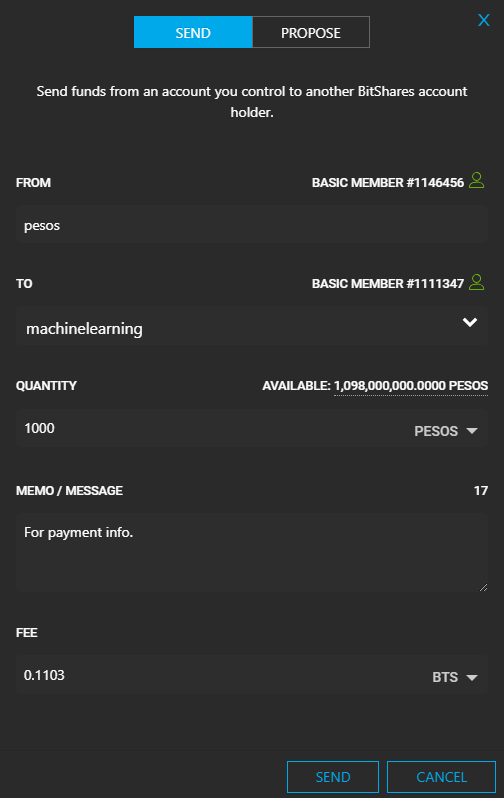 In this example, my recipient account is "machinelearning". In Quantity, sending 1000 PESOS Token. In Memo, this is optional. In this example, I've use the memo for "Payment Information". The "fee" of 0.1103 BTS is auto assign to send my transaction to the blockchain for processing. Click on Send button to finish. That's it. You're recipient will receive the token. It will be confirmed in 3 seconds or faster. Try it for yourself, it's easy and fast to send/receive payment. And if you want to buy or sell a PESOS Token, click the link in navigation menu.